Patrons will see improved load speeds. Patrons will no longer need to select clear and search to reset the filters. Simply selecting clear will return the filters to the default. 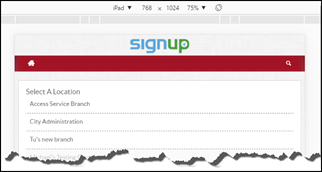 The SignUp Calendar will have a visual update as well as many changes to its functionality. The filter bar has been updated to include drop down options for each category. 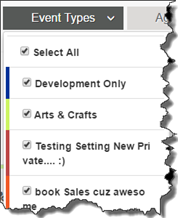 Event types now show the color associated with them in the drop down box. New Icons appear for patrons to know if registration is required, payment is required, or if no registration is required. The time of the event is also now displayed in the month view. A patron can now click on the date in the corner to view the full list of events for the day. Admins now have the ability to change additional branding elements as well, including the search button. 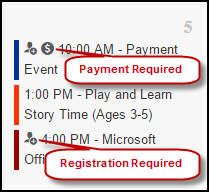 A new and easier registration page gives all the information on one page; no additional clicking needs to be done. 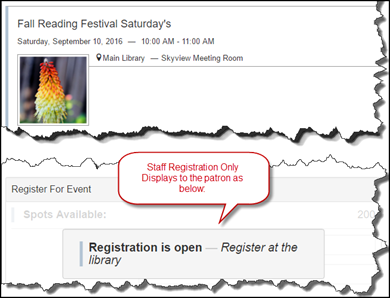 If an event requires registration on the staff side only, the information entered into the Patron Status Display field now appears on the event details page. Social media sharing, adding to a personal calendar, and subscribing for upcoming event notifications have been simplified. Share to Facebook, Twitter, LinkedIn, Google+, or email. A full article will be shared about SignUp Mobile, but here’s a sneak peek! Load speeds will be greatly improved. 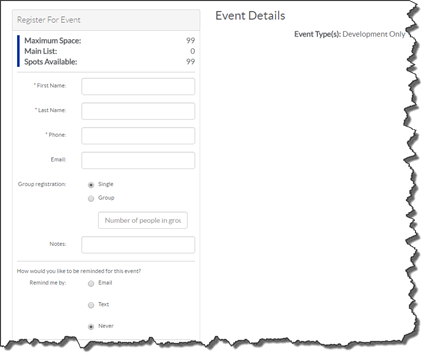 The Event List view will mirror the patron view, with additional features for staff. Event type colors will now show on the left and in the event type filter drop down. Set up and take down times for a room are clearly displayed on the event record. If an event has a set up or take down time, it is displayed within red parentheses next to the time of the event. Internal Notes will now be viewable without running a report, viewing registration, published vs. unpublished all moved to the right for easier viewing. Filter options mirror patron view and the list now uses infinite scrolling rather than paging. 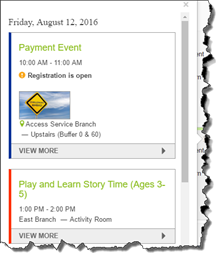 New registration page allows staff to see all important items on one screen, including spots available, event details, and if authentication is required. 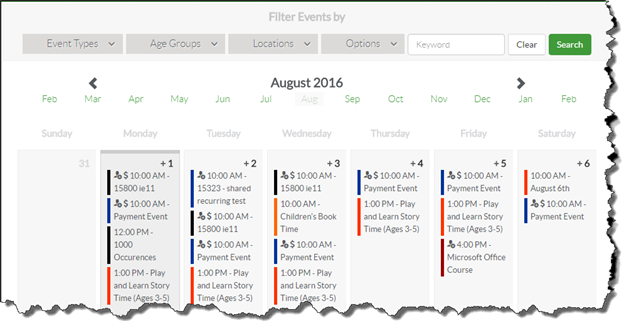 Staff side calendar view has also been updated with the new date carousel, new filter bar options, and new registration icons for both registration required and payment required as found on the patron view. Clicking on the date will show the list of events for the day. 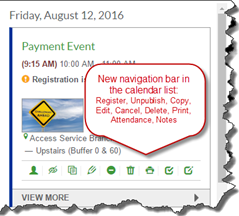 *The fly-out modal on both the patron and staff side of the calendar is being removed. It has been replaced with a pop-up modal that appears after one click on the event title. This is to decrease the time it takes to load the calendar and for making the calendar mobile friendly. *Australian customers will see a start of the week shift. The week will begin on Monday to follow the standard calendar. The date display will support international format as well. *Staff will no longer need to open a separate browser to see both patron and staff side view. 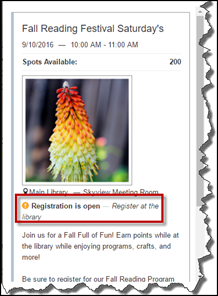 Be sure to use the patron URL when sharing event specific information. *Per feedback requests, we are removing the Notes field from the patron registration workflow. IF an event needs to have additional notes from the patron, that request will now be added as a registration question via the Add Questions workflow when creating the event. *IF an event requires Payment, there will NOT be an option to create a Waiting List. This workflow places the patron on the Payment Wait List automatically if the patron is not marked as Paid. Conversely, when a waiting list is in place payment cannot be added. *IF an event requires Payment, a warning will pop up if you attempt to copy a patron to an event without payment and it will not allow you to complete the copy. Same warning the other direction. IF you attempt to copy a patron from an event with NO payment to an event WITH payment it will not allow you to complete the function. 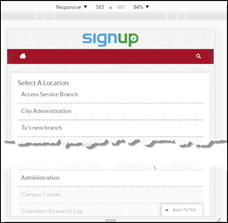 Summary: An overview of changes coming with the summer 2016 release of SignUp. Posted - Thu, Jul 28, 2016 at 9:34 AM. This article has been viewed 3556 times.